COSLYS Organic Cherry Plum Shampoo softens and nourishes dry and damaged hair. Its natural formula rich in French Cherry Plum Stone Oil and Organic Aloe Vera protects and repairs breaking brittle hair, it soothes and revitalizes dry scalp. 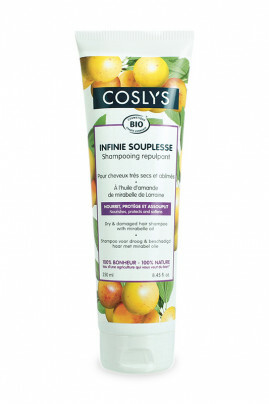 Coslys Organic Shampoo leaves your hair smooth, shiny and easy to style with a 100% natural sunny fragrance ! Un vrai bon produit! Grand format (plus grand que je ne l'imaginais à la photo). Ma fille a les cheveux secs et facilement fourchus et rebelles. Je les avais déjà trouvés très beaux après la première utilisation de l'antipelliculaire de Coslys. Là ils ont une belle couleur miel et sont bien nourris après un seul shampoing. Je suis ravie et renouvellerai cet achat. 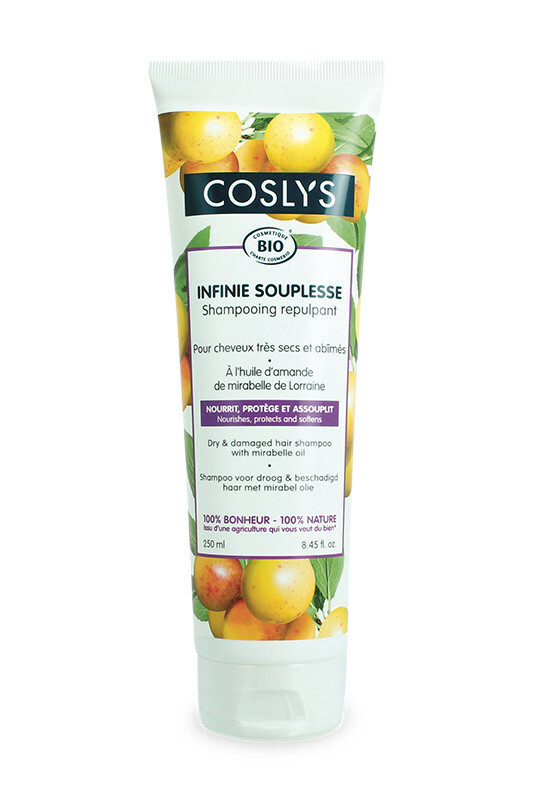 We love the warm fruity scent of Coslys Organic Shampoo ! 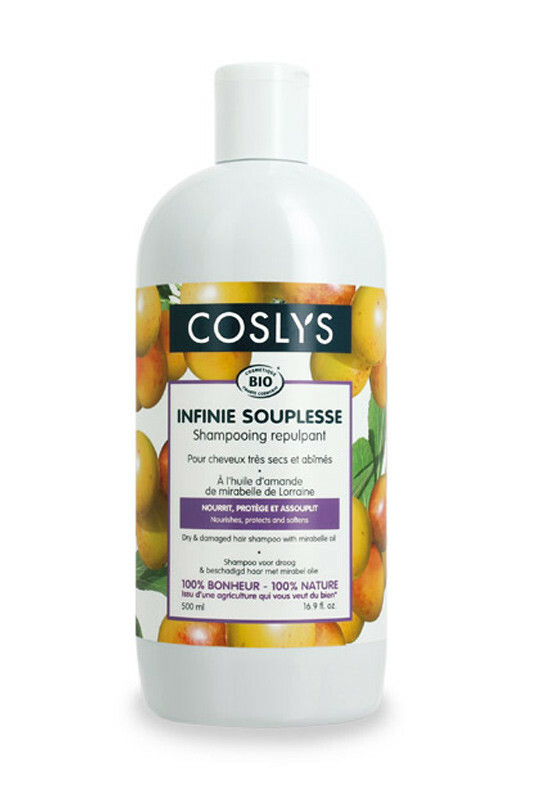 Apply COSLYS Organic Shampoo with French Cherry on wet hair. Lather then rinse with clear water. Enjoy this 99% natural shampoo free from nasty sulfates ! Aqua (eau), sodium coco-sulfate (emulsifyer from coconut), spiraea ulmaria flower extract* (organic meadowsweet floral water), glyceryl stearate SE (emulsifyer from coconut and glycerin), cocamidopropyl betaine (amphoteric surfactant from coconut), sweet almond oil polyglyceryl-6-esters, xanthan gum (gelling agent), cetearyl alcohol (emulsifyer from coconut and wisteria), polyglyceryl-2 laurate (lipidic agent from palm kernel and coconut), parfum (100% natural fragrance), aloe barbadensis leaf juice powder* (organic aloe vera extract), citric acid (pH regulator), prunus insititia seed oil (cherry plum stone oil from Lorraine, France), benzyl alcohol (preservative agent), coco-glucoside (anionic surfactant from coconut and glucose), glyceryl oleate (anionic surfactant from copra, sunflower oil, glucose and natural glycerin), sodium lauryl glucose carboxylate (anionic surfactant from sugar), lauryl glucoside (anionic surfactant from sugar), sodium chloride (sel), dicaprylyl ether (emollient), lauryl alcohol (emollient), dehydroacetic acid (preservative agent), sorbic acid (preservative agent), geraniol, linalool, benzyl salicylate (components naturally present in the fragrance).